Welcome to our Bear Hollow Ski Condo - Ground floor - 2 Bedroom + Bunk room den! 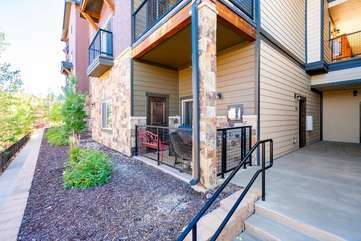 Includes heated underground reserve parking as well as a secured storage area. Located minutes away from Canyons, Park City and Deer Valley ski resorts as well as restaurants and shopping. Free shuttle services to ski resorts, restaurants and shopping is within walking distance. Clubhouse includes swimming pool, large hot tub, gym and a business center with printers and computers. Only minutes from Park City Canyons side ski Resort. 6-7 Minutes to Historic Main Street, shopping and entertainment. This condo has lots of space for family and friends. This is the perfect mountain home for any time during the year. - Spacious great room with open plan kitchen and dining room. The condo sleeps up to 11. Standard occupancy is 8. Master bedroom has a Queen size bed. It has a private en suite bathroom. Second bedroom has a full size bed with a twin bed. Third Bedroom (den bunk room) has a 4 twin beds, bunk bed style. Excellent location in the Bear Hollow Community minutes to all ski resorts, shopping, events and restaurants. Easy access to the main highway in and out of town. The free bus stops at the end of the bear hollow community. It will take you anywhere you need to go in town. A car may be optional for this location but not necessary. The shuttle service is excellent and runs throughout the year at no cost. The unit is fully equipped with towels, linens, cutlery and cooking utensils. You'll find everything you need to make this condo your home away from home. Come relax by the gorgeous gas fireplace in the front room and be fully connected with WiFi and cable TV in main room and all bedrooms. Underground parking is available and the clubhouse is open to guests of our condo. Most importantly, you have a management company that makes sure you're totally taken cared of. If you need help with anything from maid service to medical recommendations, there’s someone local available 24/7.